It’s been at least four or five years ago. I’m sitting along Park Avenue with Linda D ‘Auria, the owner of Linda’s Winter Park Diner, her sister Rose, a few others, having lunch. Having grown up in the New York area, Rose was as big a fan of Moonstruck as I, so we took off humorously reciting as many quotes as we possibly could. 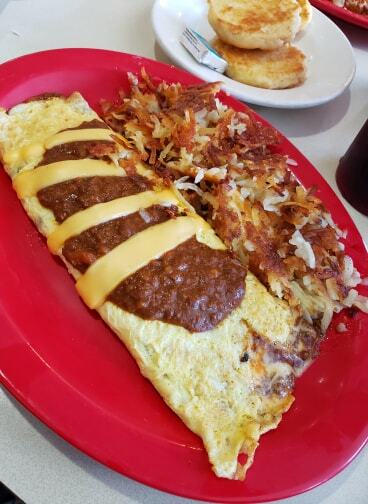 My partner’s favorite: The Chili Cheese Omelet. Yeah, I got one yesterday, also. As much as I tend to feed my girls (our dogs) from the table, they aren’t getting anything from my plate at Linda’s. And if you try, yeah, I may just kick ya. Yeah, you’ll need to also LUV the movie to get the reference. My other half and I were back at Linda’s yesterday, knowing today she celebrates 31 years as the proprietor of Winter Park’s FAVORITE diner, Winter Park’s FAVORITE diner owner & crew! CONGRATULATIONS, Linda! As well as to her many long time employees. To commemorate the day, I am re-sharing a piece I wrote to celebrate her 25th anniversary in 2013. Time does fly . . . . delicious! 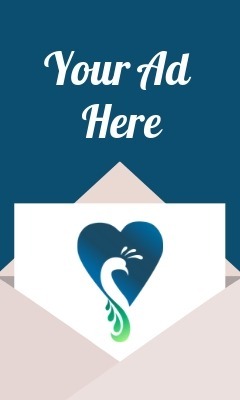 Linda’s is ALWAYS a #5LUVs experience and another unique piece of what truly makes Winter Park a LUVly place to live. April 1, 2013 :A kid in the 1970s, I guess I came to believe “diners” were the places of characters like Florence Jean “Flo” Castleberry, Fonzi and crew from ‘Happy Days’. I’m not sure I understood it was also that little place called Berry’s in Brevard, North Carolina, where I grew up, a brick building of mid-century architecture, with cheery servers, the clinking and clanking of dishes and glasses the delightful background of so many Local breakfasts and lunches, conversations, deals, special occasions and more. 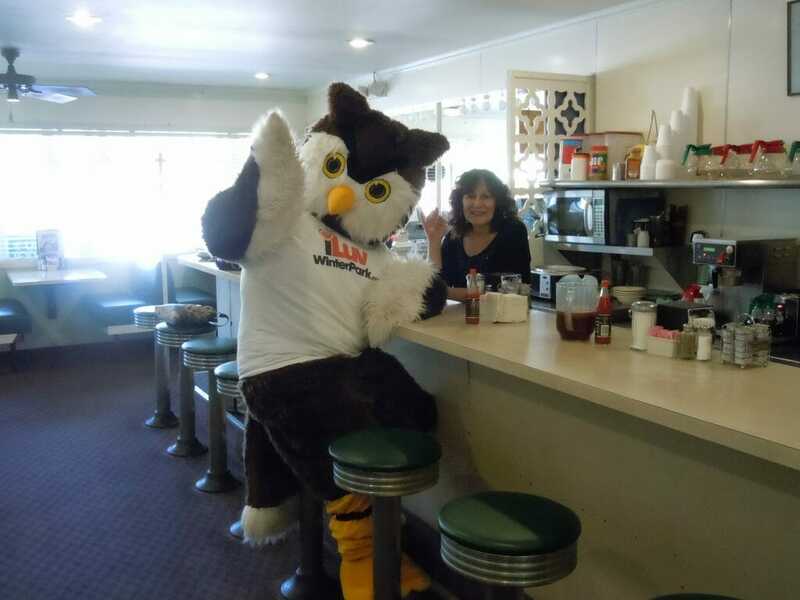 Locals LUV Linda’s Winter Park Diner! Including Parker! My first real appreciation of the classic American diner, what it can mean to and for a community, to its residents, was having my partner take me to Pensacola for a weekend, his endless lauding of the breakfast hot spot – ‘The Coffee Cup’ – he remembered so fondly, was so anxious to visit again, to enjoy its biscuits and grits. Something so fondly remembered, built up in one’s mind can end up being a disappointment when experienced again. But that was not the case here. It was as good as he remembered, as he’d assured me it would be. And so we did many times. It’s funny and I think uncommon when you can remember specific first visits to any business. I hear and see the unrealistic supposed recollection of things on television and consider whether I need a memory jump start. After a long period, it takes something special, someone unique to stand out, to truly be remembered. I can recall the first time I went to Linda’s Winter Park diner. These biscuits are the BEST! And we recommend having them “grilled” to lock in even more yummy taste! I was told by Linda recently the diner has appeared in a few movies. A member of a production crew once told her not to change a thing, that it was difficult to find the sort of authentic, Local diner environment found at the Winter Park Diner. Perhaps that was part of it, surely it was, part of why I remember that first visit. But it was also our server, Gina, Linda’s daughter, the food and more. I don’t remember the specific conversation, but I remember Gina was funny, she was engaging, had a quick wit. I can’t recall specifically what we ate, but I do remember we remarked the whole time how good it was, how delighted we were to find a keeper. We left that morning with one to leave on the list. When you find such a place in a new home, it always feels good, makes it feel that much more like home. In visits since I’ve come to understand that while many diners, restaurants and delis serve great food, a diner like Linda’s develops ardent and enthusiastic fans. The food is surely a big part of it, keeps them coming back. But it’s also about the personalities involved, the stories, a feeling of community which takes hold and cannot be manufactured, no matter the effort. 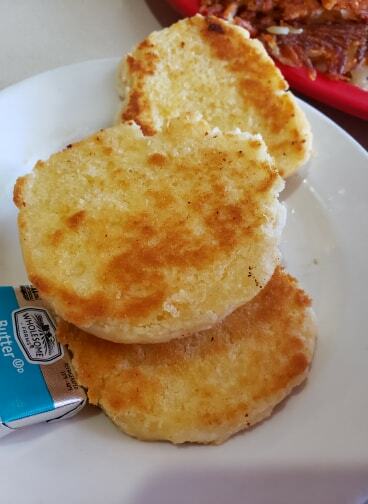 I’ve observed staff many times – among them at least one who’s been there the entire 25 years Linda’s owned the diner — who can record a full order before the customer says a word. I once sat at the counter as a guy sat down at a stool in silence as the server behind the counter made eye contact and then recited a rather long list of menu items, specific preparation orders to him. He nodded and off she went. I think I laughed, but it was nothing out of the ordinary to them. In diners which dot the landscape of America, this surely still exists in other places as well. But the Winter Park Diner may be the first place I’ve found where the regulars claim they can order for the other regulars. Everyone knew your name at Cheers. But, many of them can apparently order for you at Linda’s. While Linda has owned the Winter Park Diner for 31 years. It’s history goes back much further still. 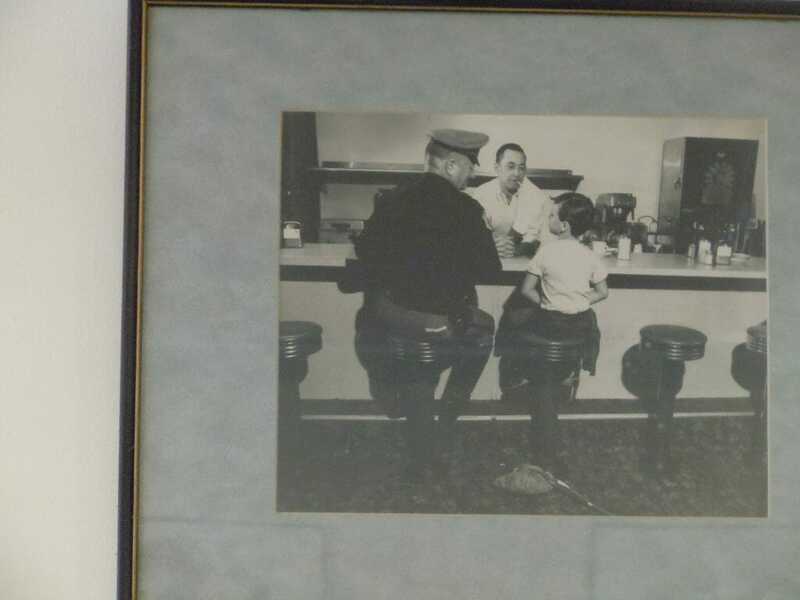 This photo, which hangs in the diner, is from its earliest days. I sat at Linda’s counter earlier this week listening to Linda and two long-time customers, Lisa Lyons Coney and Beth Wood, chat with Linda, talk of how they met. Lisa came into Linda’s the first time when she was 16, now works for Carey Hand Cox Parker Funeral Home just down the street, is back at Linda’s regularly. Beth, who works in costuming at the Bob Carr Theater, stops at Linda’s for breakfast each morning and most often takes lunch with her for later. America’s diners serve up so many various slices of pie every year while they go about enriching the American pie of which they are a truly special part. 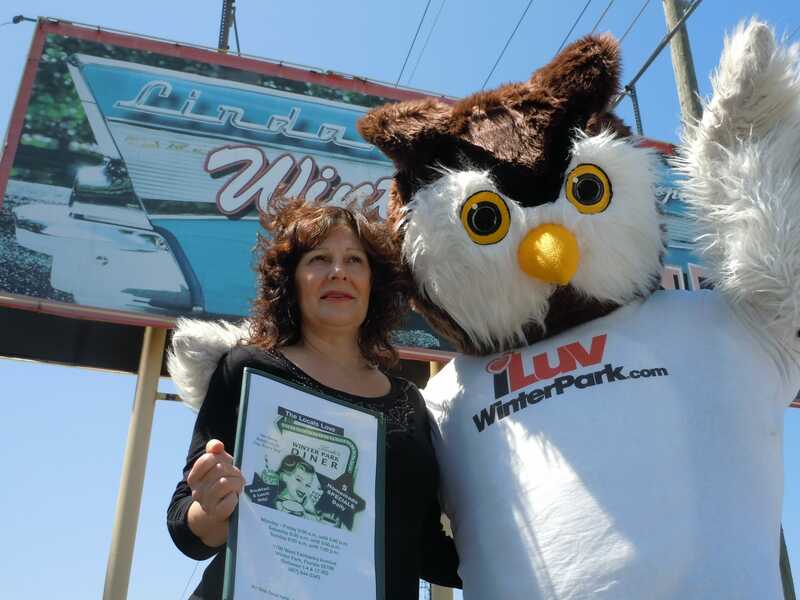 Come celebrate the Local version, Linda’s Winter Park Diner, with Linda and crew on Monday.